Unique system of sliding panels. Perfect interior decoration with elegance. Hand or electric operation. 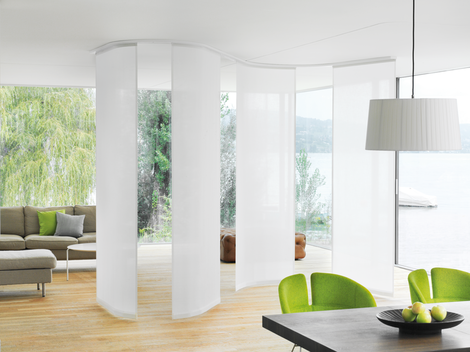 Choose between the regular Panel Glide system or the world exclusive new Folding Panel system. Hand/draw rod operated panel glide systems can be connected or unconnected. Unconnected panels move individually and offer endless ways to adjust the light, giving your room design flexibility. Connected panels are easily operated by an optional draw rod. One cord operates the panels, and multiple stacking options allow you to truly personalise your panel system. Motorised panel glide can be operated via switch, hand-held remote or the Silent Gliss Move app.